July has been wet... and cold. 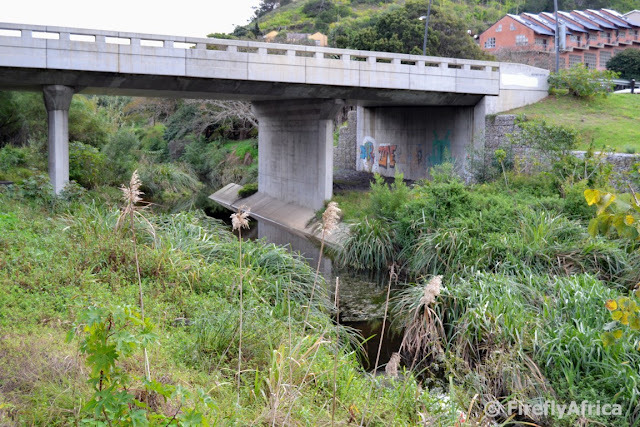 Over the last few weeks we've had a lot of rain in Port Elizabeth and last weekend the Baakens River broke it's banks again in the lower valley as it often does after this kind of rain. Check out the video by the Herald showing the water right up to the buildings on Lower Valley Road. 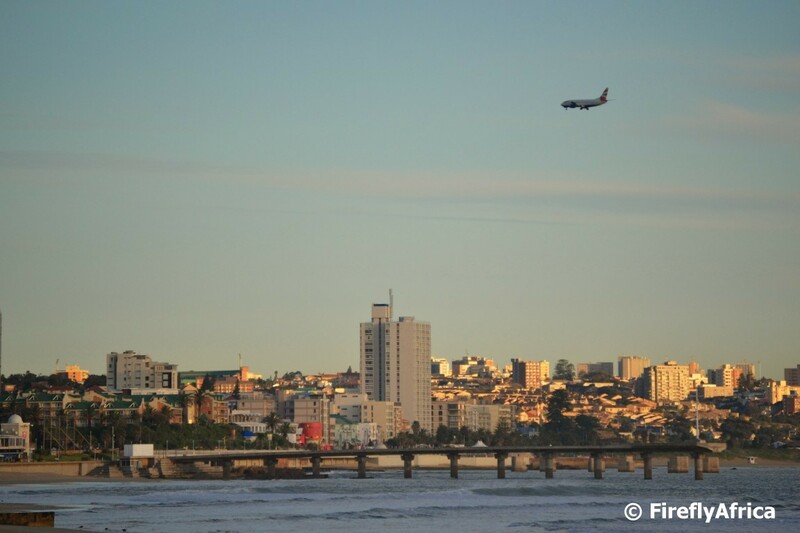 As one who works in the tourism industry I love seeing planes flying in over the Port Elizabeth beachfront. I don't just see it as a plane going to the Port Elizabeth Airport. 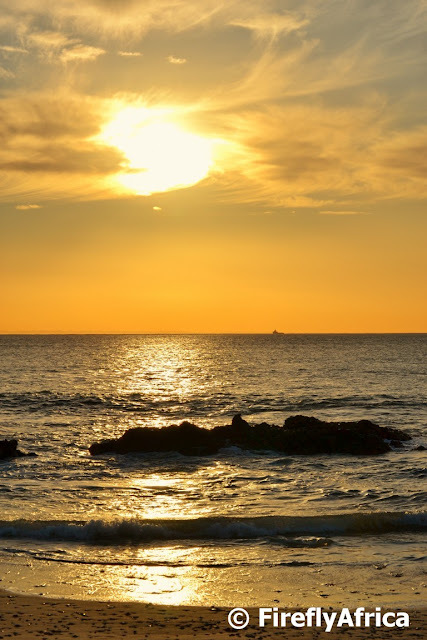 I see it as visitors coming to Port Elizabeth to experience this beautiful place and everything it and the surrounding areas have to offer. The Sundays River Ferry recently launched the newest activity to add to the area's diverse mix of things to do. Sand Sledding. Sand sledding is an easier option than sand boarding as you don't have to worry about keeping your balance or falling hard. 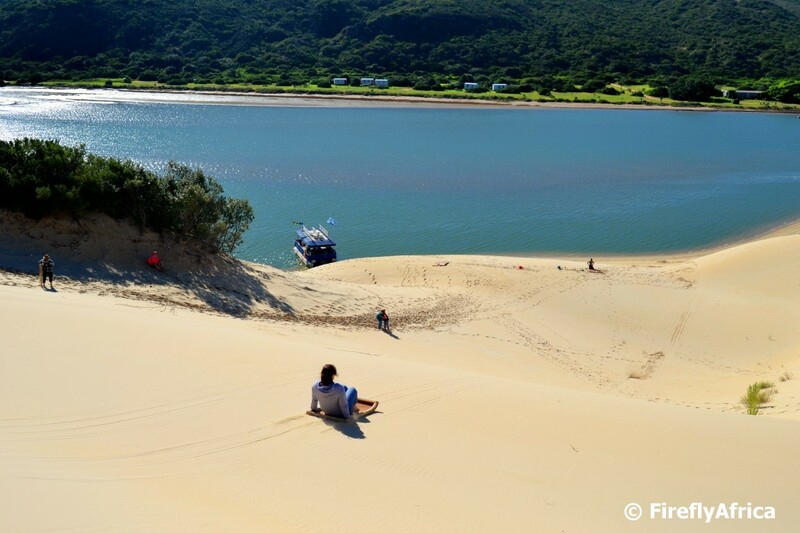 The experience starts with a cruise down the Sundays River on the ferry before hitting the dunes. The boards are custom made and resembles snow sleds. The instructor shows you exactly what to do and believe me, it can be done by anybody. The oldest person in the group when I was there was 76 years old and he did it without any hassle. In Afrikaans there is a saying, "Die môrestond het goud in die mond" which is the same as "The early bird catches the worm." The Afrikaans one has more relevance to this picture. You know how it can happen that you see something every day without registering that you've actually seen it. A good example is a fading sign outside a building. You don't always realise its faded until somebody points it out to you and you have a proper look. Well, I think the view of the Nelson Mandela Bay Stadium from the beachfront is one of those. 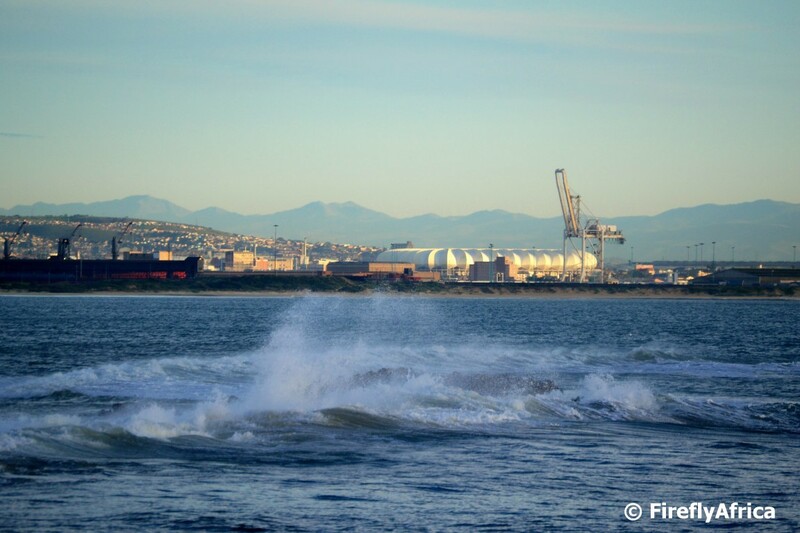 How many people actually notice the stadium beyond the harbour when they are walking along the beachfront walkway? Next time you do, stop for a second and have a look. I bet you didn't quite remember that its visible from there. 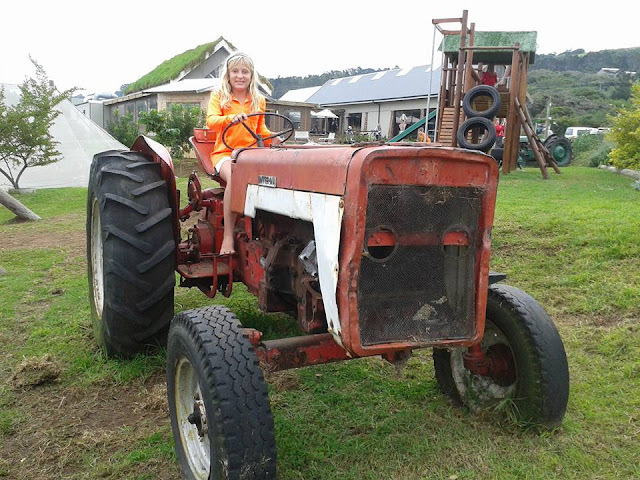 Its been a cold and wet week with close to a 100 mm of rain that has already fallen. Friday saw a break in the clouds before the next cold front hits us for what seems to be a wet weekend. 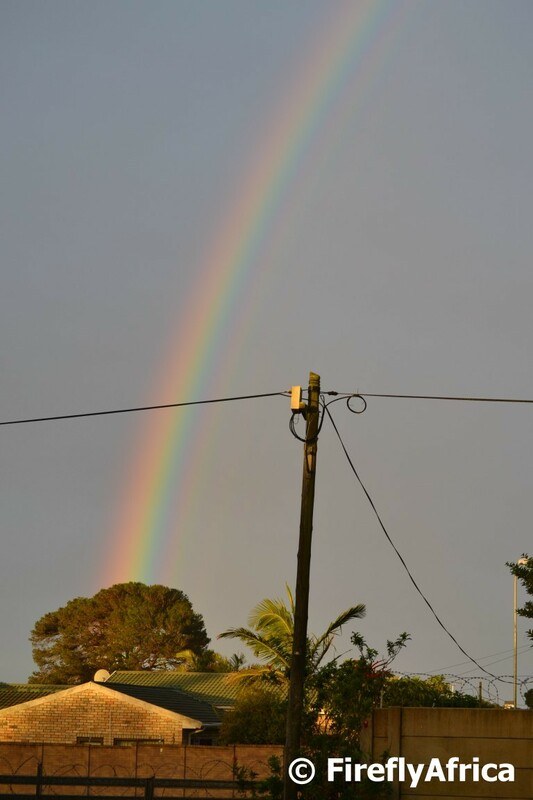 On our way home yesterday afternoon the KidZ spotted a full rainbow streaking across the sky and as I drove down our street the one end disappeared behind the houses at the bottom. I grabbed my camera and just snapped this picture when it started raining again. Stay warm my friends. I am very stoked today after being featured in an article in the Afrikaans newspaper, Die Burger. It's actually the second time I make the paper in two weeks after the article about the launch of Travel Massive Port Elizabet last week. This article is about me though and my blogging along with the fact that The Firefly Photo Files was runner-up in the African Blogger Awards' Photography category. 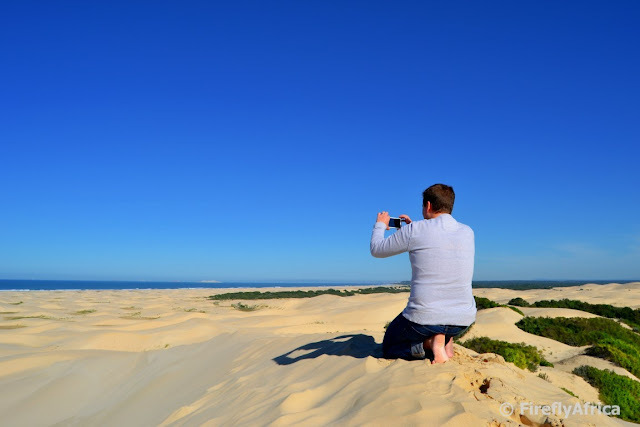 Travel blogging is huge in the Western Cape and Gauteng while in the Eastern Cape tourism products are only starting to tap into the exposure that blogs, along with the social media that goes with it, can give them. Anyways, this post isn't about educating people about the benefits of blogs, its to brag a bit with the article. Today the documentary Blood Lions gets release and to coincide with that, travel bloggers from all over South Africa decided to put their voices together to call for #AnimalRightsInTourism. Blood Lions put the focus on the canned hunting industry which has direct links with places offering lion cub interaction. Does people who get to play with lion cubs realise where that cute little cub goes when he is all grown up? Probably into a small fenced enclosure and right into the sight of a trophy hunter. The cute little cub doesn't stand a chance. He can't even try to get away. I'm not going to lie. I've petted cubs not thinking what will happen to them. I've rode on an elephant and you probably read it on one of my blog posts. One never thinks what those elephants went through to become the "obedient" animals they are today. Obedience or fear? 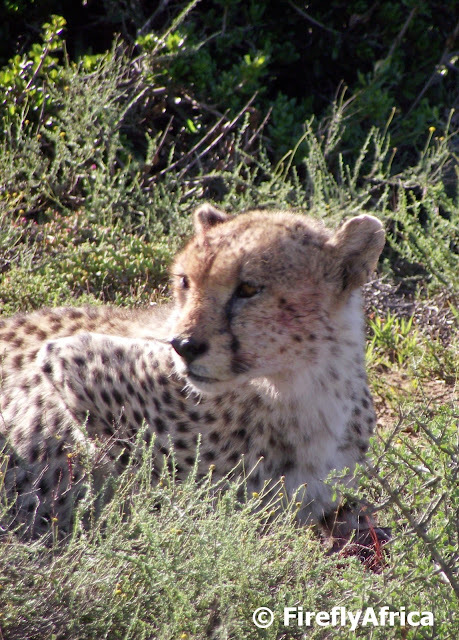 Not long ago I visited an Eastern Cape game reserve and one of the things our group did was to "walk" wild cheetahs. Not walk as in taking them for a stroll. Walk as in approach them on foot but staying a respectable and safe distance from them. Observing them in their natural environment and not intervening compared to walking them while they have leases on. Over the last few years my view on #AnimalRightsInTourism has changed drastically and I would rather see them in the wild than interact with them in captivity. After the flooding that took place in 2006, the old bridge at the bottom of Brickmakerskloof was washed away. After what felt like years (perhaps it was), work started on the new bridge. Visiting Bridge Street Brewery for the launch of Travel Massive last week I snapped this pic of the "new" bridge. Long not new anymore, one can see how the vegetation has established itself around it again. A tray of beer tasters for a group busy with a brewery tour at Bridge Street Brewery. I'm not much of a drinker but I love their award winning Pilsner, made right there at Bridge Street by legendary beer brewer Lex Mitchell himself. 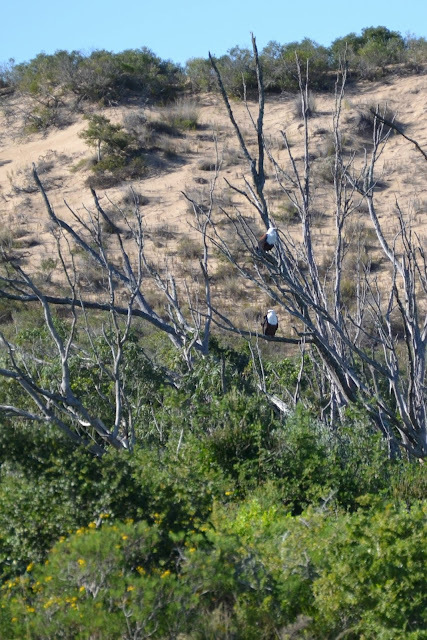 A cruise on the Sundays River to go sand sledding had us spot a pair of fish eagles next to the river. What a sighting! 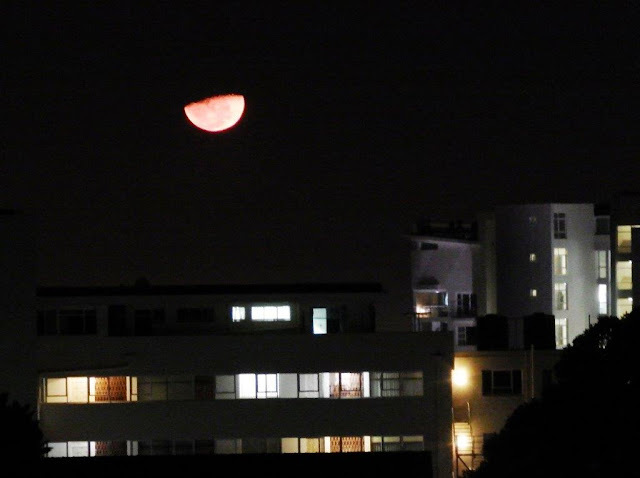 Wish they were closer though cause this was the best I could do with my long lens. 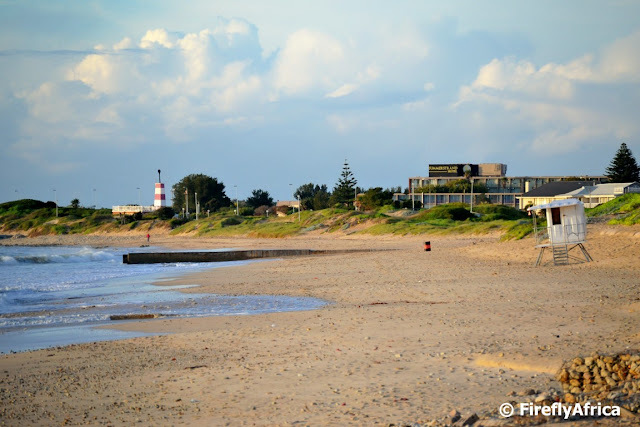 Earlier this week I had a coffee meeting at Primi at Brookes-on-the-Bay. Just for those who don't know where Brookes-on-the-Bay is. It used to be called Brookes Pavilion. Heading back down the outside steps to my car I just had to snap this pic with my mobile. You can't but help love the stunning views the restaurants in the complex has of King's Beach. People don't want to believe me when I tell them that the Great (South African) Flag on the Donkin Reserve is 15 meters by 10 meters in size. That's about the size of a tennis court. Flying at the top of the 65 meter high flagpole it's hard to imagine the size, but when they bring it down in the afternoons you actually get a better idea of how big it is. Now imagine a flag that size being taken down in a gale-force wind. Normally they bring it down (or not even put it up) if the forecast is for strong or gale-force winds, but sometimes they are caught off guard. Like in this video. 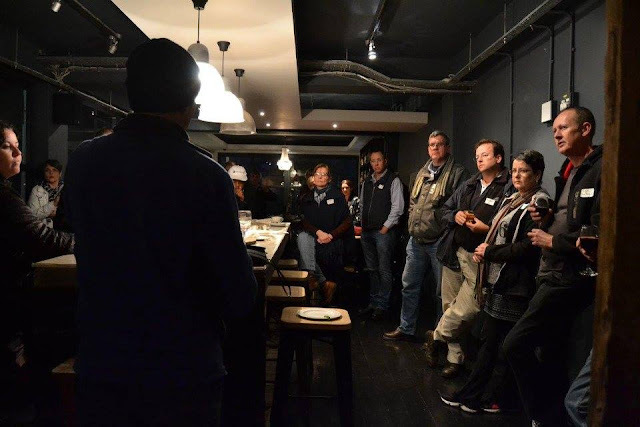 Last night about 25 people from all spheres of the travel industry came together at the Bridge Street Brewery for the launch of the Port Elizabeth chapter of Travel Massive. Travel Massive originally started over a six pack of beers on a hotel roof in Sydney, Australia and has expanded to a network of travel industry insiders (from accommodation establishments, restaurants and conferencing businesses to tour operators, marketers, travel bloggers and media) with 101 city chapters in 46 countries world wide. 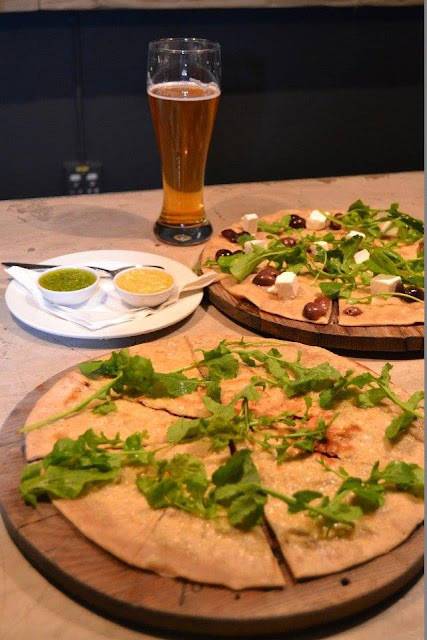 It first came to South Africa in early 2014 when the Cape Town chapter was started and has since expanded to Johannesburg, Durban and Port Elizabeth. The Port Elizabeth chapter leaders are made up of myself, Phrosne Phillips of Brochure Management, Geoff Applewhite of Gardenview Guesthouse and Craig Duffield of Mosaic Tourism. 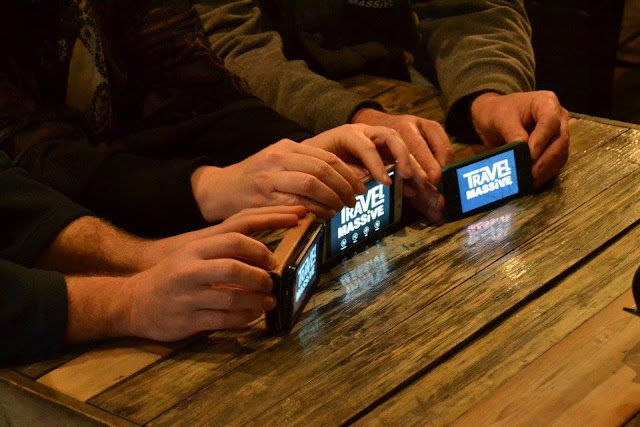 Check out the Facebook group for more pictured from last night's event. 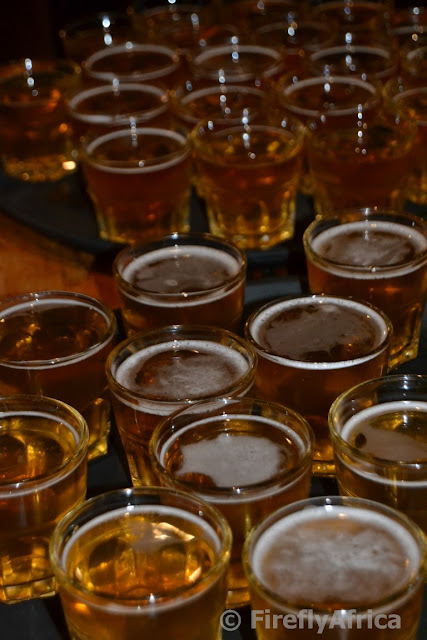 Did I mention there was lots of craft beer? 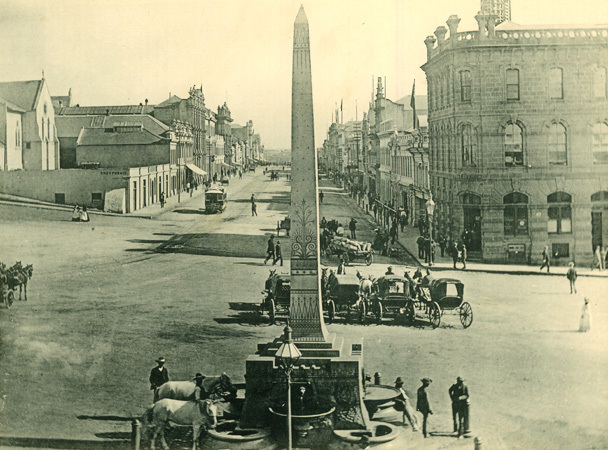 If you know a bit about Port Elizabeth's history then you will know that at one stage there was an obelisk standing on Market Square in front of the City Hall. The obelisk is known as The Prince of Wales Obelisk and was brought to South Africa by the founder of the Eastern Province Herald, John Paterson to be placed on the grave of his partner, George Kemp. The Kemp family decided that it was too elaborate to place on the grave and donated it to the city. The City then erected it in front of the City Hall on 22 May 1863 to commemorate the Prince of Wale’s marriage to Princess Alexandra. In 1877/8 four water troughs were added and filled with water during a “tap ceremony” when water was first piped to Port Elizabeth. The obelisk was removed in 1921 and stored until 1975 when it was placed in front of Bayworld in Humewood. But what happened to the four water troughs? 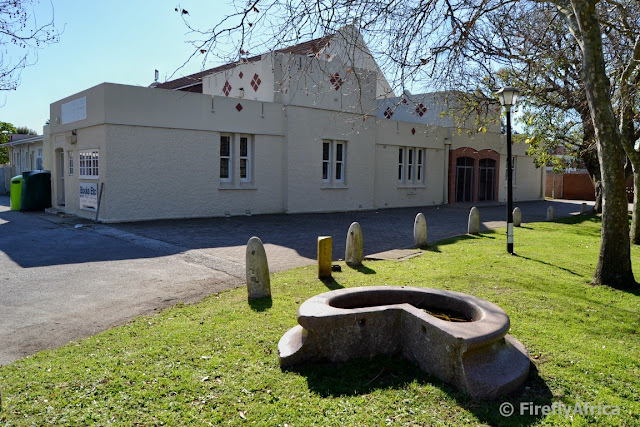 One of the water troughs was placed on the lawn at the Walmer Town Hall where it can still be found. I bet most people have never actually noticed it or even though what it was. The location of the other three troughs is unfortunately unknown. After yesterday's picture of the Apple Express narrow gauge line I decided to post another picture featuring the line. 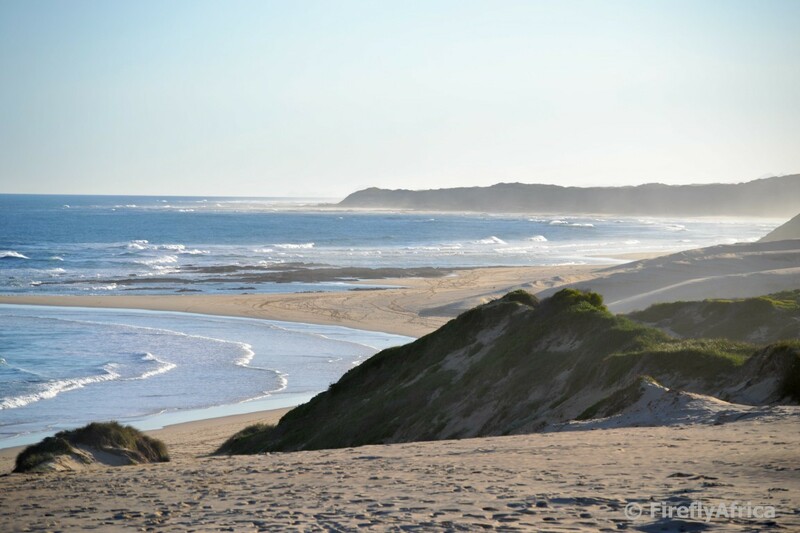 After the line leaves Loerie it heads towards Jeffreys Bay across the lover Gamtoos Valley plains. Not far outside of Loerie the line crosses over the Loerie Spruit (a tributary of the Gamtoos River) before passing through Melon Station. There's just something about these old railway and road bridges, isn't there? 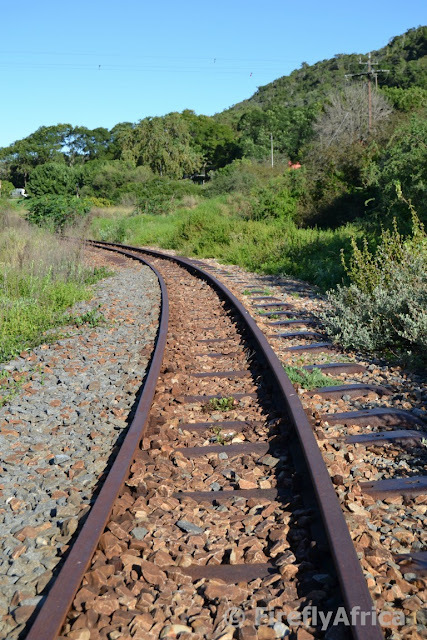 The Avontuur Railway, better known as the Apple Express narrow gauge line, was built between 1890 and 1906 to link the fruit growing Langkloof with Port Elizabeth. 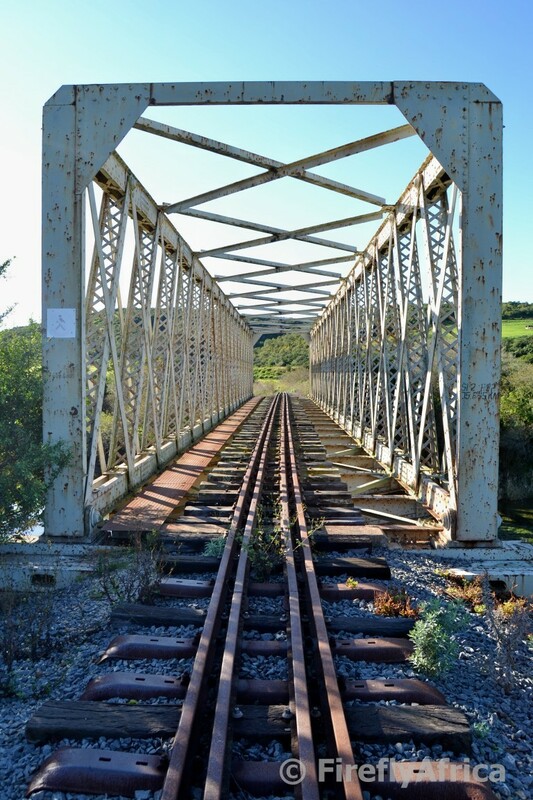 The line doesn't just cross the highest narrow gauge railway bridge in the world, but at 285 km is also said to be the longest narrow gauge line in the world. So sad to see it not being used and falling further and further into disrepair. 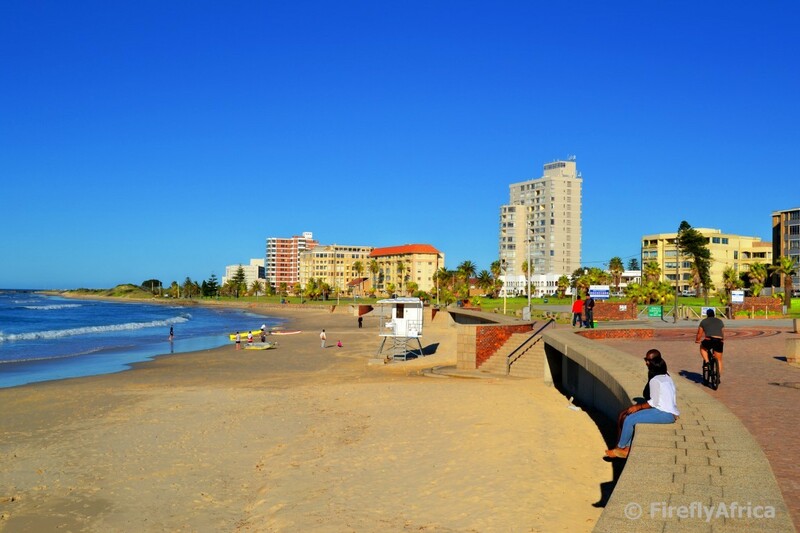 Most of Port Elizabeth's monuments are located around Central and the city centre. There are a few outside of those areas though. 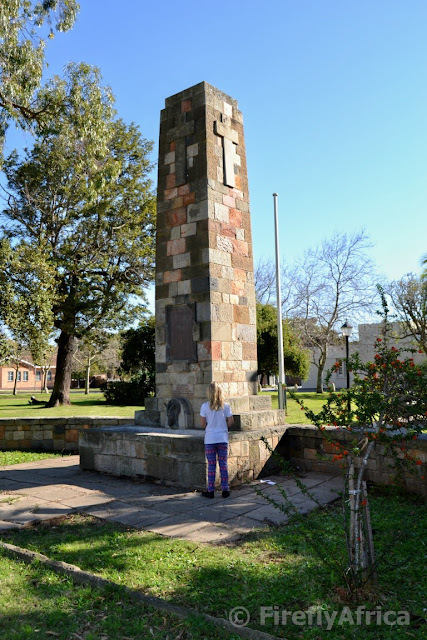 One example is the Piet Retief monument and another is the Cenotaph in front of the Walmer Townhall. I stopped at the Cenotaph with Drama Princess and snapped a few pics while she was checking it out. The Cenotaph contains the names of the men from Walmer who died during the two world wars. Why does Walmer have a Cenotaph while there is one in front of St Georges Park as well? Well, Walmer used to be a town of its own independent from Port Elizabeth until the 1970's. There are certain geocaches which is just easier to do if you have a kid with you, especially when it is hidden somewhere around a kiddies play area. This was the case last weekend when I stopped by Grass Roof on Seaview Road and needed Drama Princess to cover me while looking for cache. She immediately hopped on the tractor and I pretended to take a picture of her while retrieving the container. 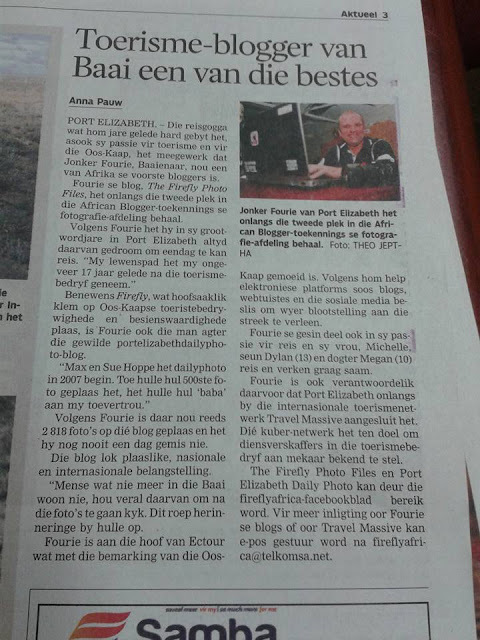 PE Daily Photo regular, Gerhard Burger, sent me this picture yesterday. It seems he is a bit of a night wolf and his comment in the email: "People don't know what they are missing when they go to sleep before midnight." Good thing the moon wasn't full otherwise the night wolf would have been running around on all fours down the street it seems. 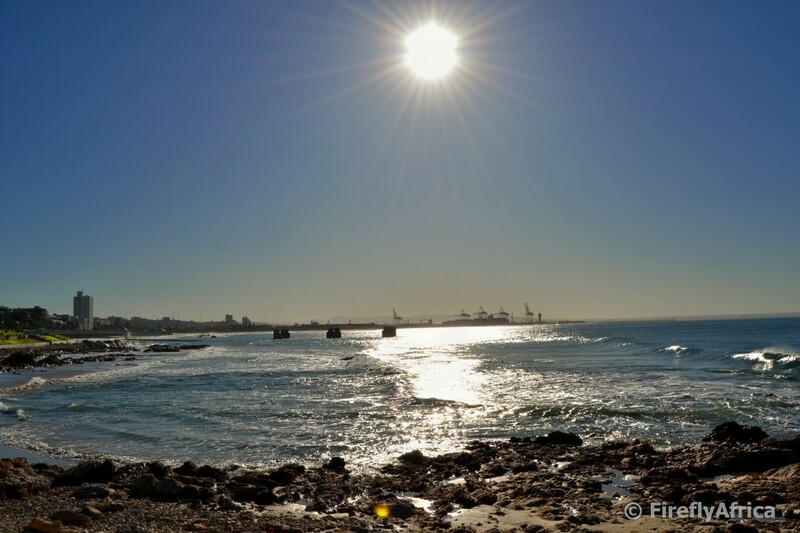 A sunny winters day in South Africa is probably close to a summers day in parts of the UK. 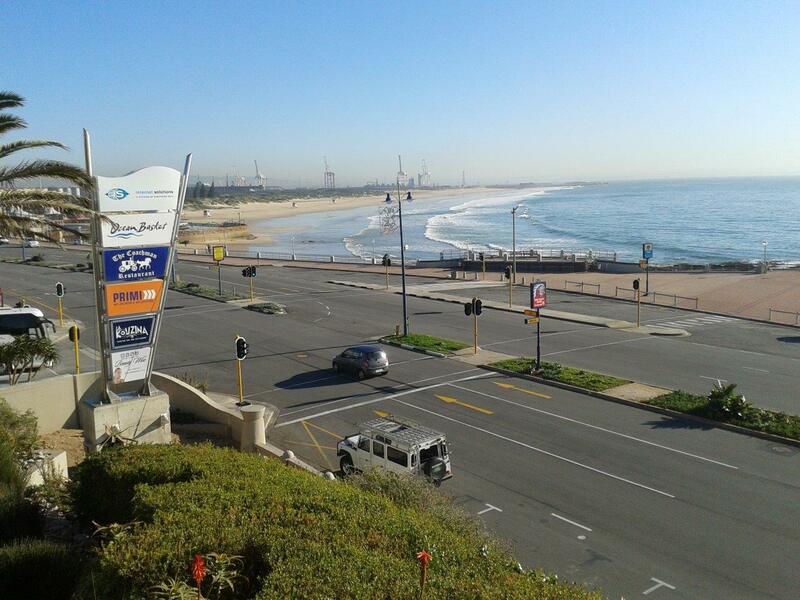 We've had a few of those in the last week or two and this is what Hobie Beach looks like on a week day like that. I met a fellow travel professional for coffee at Blue Waters Café the other afternoon and before heading back to the office took a walk over to the Pier to see how the work is (not) progressing. Looking towards Humewood Beach and the city beyond this was the view. Don't you just love sunny winters days? 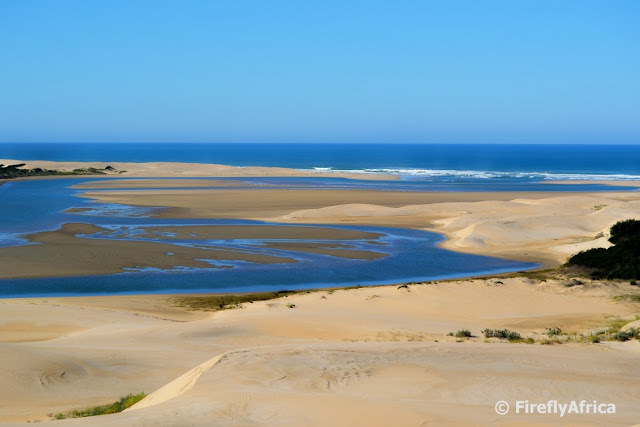 A trip out to Colchester to try out the new Addo Sand Sledding experience meant that I had the opportunity to climb the dunes next to the Sundays River again to enjoy the magnificent view over the dunes and Algoa Bay towards Port Elizabeth. I caught my friend Erenei snapping a couple of pics at the top and made him sit and hold his pose for a while for me to get a few pics of my own. Always nice to have somebody in the picture to anchor it. Not that a beautiful view like this needs an anchor but it does help to create some perspective. 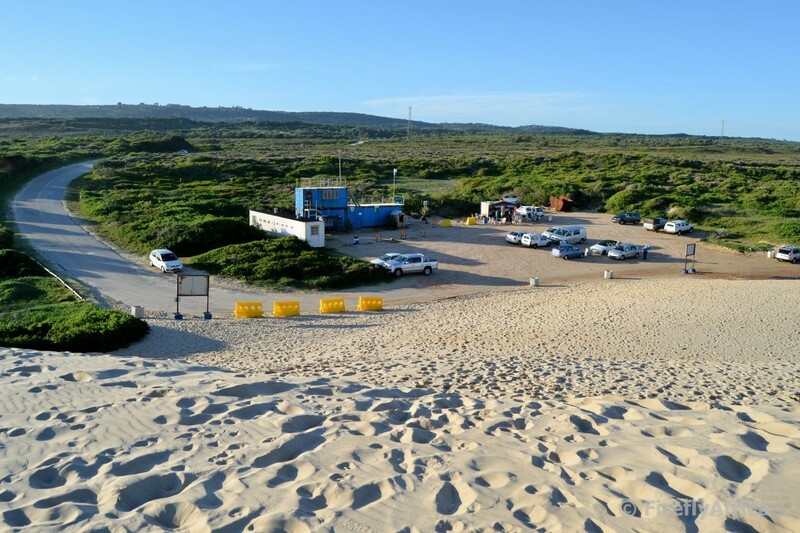 The view west from the top of the dune by the parking area at Sardinia Bay. It can't be denied that we have some of the most beautiful scenery in the country right here on our doorstep. The Sardinia Bay migrating dune has now decided that it is time to occupy the parking area as well. The entrance to the parking area now barely has space for one car to pass through and I'm sure it won't be long before a new plan will have to be made. 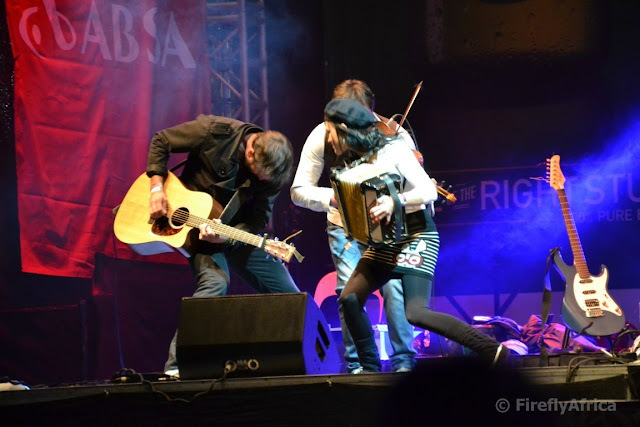 I was looking for a video about this year's ABSA Kirkwood Wildsfees for this week's Friday Video post. Unfortunately they haven't uploaded a video for this year yet so I decided to go with a video about the 2014 Wildsfees. A couple of artists and activities may have been different, but the vibe is still the same and you can get a good idea what it's about if you haven't been there. We've all driven past the Sundays River at Colchester while on the N2, but have you ever wondered what the river mouth look like. I can't say that I have actually been to the river mouth before, but I have seen it from the top of the dunes at Colchester. The Radio Kalahari Orkes rocking the the ABSA Kirkwood Wildfees stage on the first night of the festival. Click this link to read my whole full post about the festival on The Firefly Photo Files.